Most long-time macOS users will be aware of the Application Switcher. It's invoked using the Command+Tab keyboard shortcut, and lists all of the apps currently running on your Mac, enabling you to quickly switch between them. 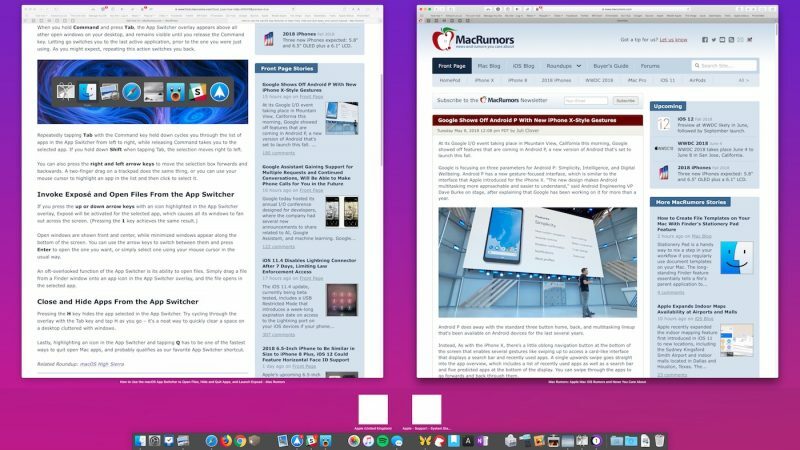 In this article, we'll run through the Mac App Switcher's most basic functions, and then highlight some of our favorite lesser-known App Switcher tricks that you're bound to find useful once you're familiar with it. When you hold Command and press Tab, the App Switcher overlay appears above all other open windows on your desktop, and remains visible until you release the Command key. Letting go switches you to the last active application, prior to the one you were just using. As you might expect, repeating this action switches you back to the previous active app. Repeatedly tapping Tab with the Command key held down cycles you through the list of apps in the App Switcher from left to right, while releasing Command takes you to the selected app. If you hold down Shift when tapping Tab, the selection moves right to left. You can also press the right and left arrow keys to move the selection box forwards and backwards. A two-finger drag on a trackpad does the same thing, or you can use your mouse cursor to highlight an app in the list and then click to select it. Open windows are shown front and center, while minimized windows appear along the bottom of the screen. You can use the arrow keys to switch between them and press Enter to open the one you want, or simply select one using your mouse cursor in the usual way. An oft-overlooked function of the App Switcher is its ability to open files. Simply begin to drag a file from a Finder window, then invoke the App Switcher and drag the file onto the relevant app icon in the overlay. Let go of the file and it should open in the selected app. Pressing the H key in the App Switcher hides all the windows of the selected app (pressing the H key again reveals them). Try cycling through the overlay with the Tab key and tap H as you go – it's a neat way to quickly clear a space on a desktop cluttered with windows. Lastly, highlighting an icon in the App Switcher and tapping Q has to be one of the fastest ways to individually quit open Mac apps, and probably qualifies as our favorite App Switcher trick. Trying to hold Command and Shift and pressing Tab to go backwards is a bit of a hassle. Instead, once you initiate the App Switcher by pressing Command-Tab, you can continue holding Command and tap the key above the Tab key (the key with the Tilde, or "~" on it). This will also go backwards on the list, and is far easier than trying to hold Shift. The only thing I didn't like about macOS switcher was switching between windows of the same app. This is done using cmd+` but ` on my Swedish keyboard is to the left to the backspace and I have to press it together with shift to use it. Cmd+shift+´ is a really bad combination to press if you just want to switch windows quickly and there is no way to switch in reverse order. I changed it to just alt+tab. So now I have cmd switching apps, alt switching windows and ctrl switching tabs. Didn’t know about up/down and H/Q functions in app switcher! Even long-time Mac users learn hidden features of MacOS sometimes! Keyboard to switch between windows in the front application. I have the App Switcher mapped to the scroll-wheel button of my mouse (using the mouse driver called SteerMouse) and it makes switching between apps quick and swift. These recent How-To Articles are REALLY awesome. Most of the times I know the things already... but there are STILL new things to discover... there's no way any one person will know all of these things! Keep 'em coming!!! Thanks again for these types of articles. As someone relatively new to macOS (2016), I’m still learning about little features here and there every week. It was only recently that I discovered Cmd+Tab and only because I noticed someone on YT bring up the app switcher and immediately looked it up. I used to just use Mission Control. I’ve actually gone back and watched keynotes of the old OS X releases to learn about little features that have long been part of it. Keep these tips coming! You’re missing the all time classic how to bring back a minimized app! Command tab to it. Hold down tab and move the finger from command to option. Let go of tab. Profit! I was about to post this god-send of a tip too, but I noticed you already did! Although you've got the keys the wrong way around. The correct way is to Cmd+Tab, hold down CMD and then move your finger from tab to option (alt), then let go of CMD. My all time favourite use of the application switcher. Cmd-Tab & Cmd-Q is nice, except when you want to do something else after quitting an application. The app starts quitting, and when it actually quits (which can be a quite random interval), the focus goes to the next application, instead of the focus disappearing. So you will be quit or switch to the second intended application … or a third innocent one. Nice article, did not know few handy things ..